For 1,5 seconds before touching the crew, the steering wheel column turned "on itself" to the stop and the engine control lever No. 2 moved to the 0 position. The first touch on the ground surface was carried by the wheels of the main left landing gear of the aircraft to the eastern part of the planned ground section of the flying field at 88 on the right of the center line at 350 m from the output end of the 32R strip. The plane through 12 m touched the ground with the main right support of the chassis. The aircraft at a distance of 137 m from the output end crossed the strip to the left to the right and entered the CPB. The aircraft at a distance of 60 m from the output end touched the ground for the first time by the front support of the chassis. The aircraft at a distance of 165 m from the input end started the forward part of the fuselage to touch the ground when the front landing gear was broken. Further movement along the ground lasted with a deviation to the left of the axis of the strip. 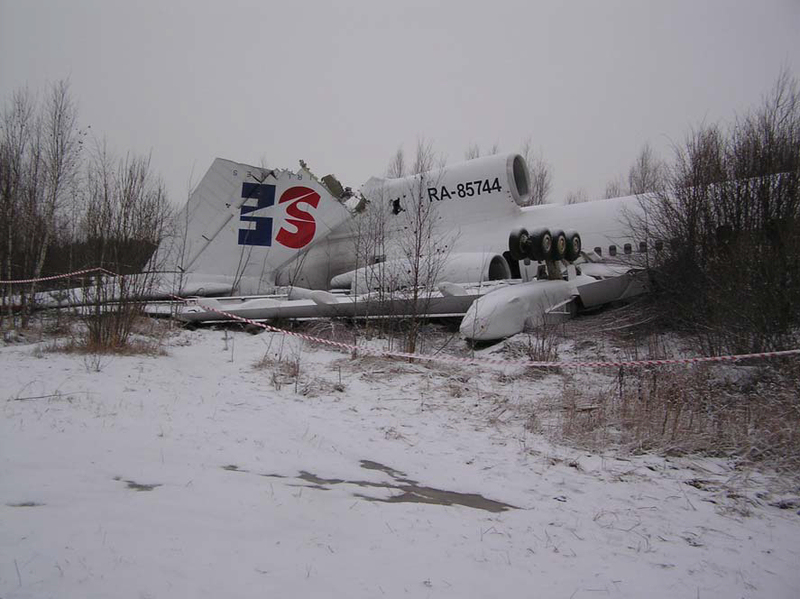 At a distance of 590 m from the exit end of the strip and to the left of the extended axis of the strip the aircraft demolished two MRC signaling supports, whose height reached 3 m. After another 175 m the aircraft collided with an earth embankment that was overgrown with young trees, the steepness of which was 30 degrees and the height up to 6 M ,. The plane stopped on the embankment. The fuselage broke in two in the area of ​​32 and 34 frames. The keel, the stabilizer, the elevator, the right wing plane, when colliding with the embankment, separated. The end part of the left plane was broken off when it collided on the top of the embankment with a metal truss. The detached front part of the fuselage is largely deformed and was at 1175 m from the point of the first touch of the ground by airplane (825 m from the exit end of the 32R strip), at 63 m on the left of the continuation of the axis of the strip and 9 m from the reinforced concrete fence of the outer fence of the airport. There was no fire. Killed two passengers who were on the ground 3B and 1. 33 passenger and 6 crew members were seriously injured. 53 passenger got off with minor injuries. Total on board were people 171: 8 163 crew members and passengers. Total killed 2 people: 2 passengers.